An Islandmagee petrol head is hoping to power his way into the history books by setting a new land speed record on his homemade motorcycle. Sam Marsden, a mechanical engineering graduate, has spent the several months painstakingly assembling a 1000cc streamline bike in his father’s shed at the family farm. With his labour of love almost complete, Sam now hopes to take his creation to the Bonneville Salt Flats in Utah, USA, where he will attempt to fulfil his dream of smashing a record which has stood for almost half a century. The current land speed record for under 1000cc motorbikes stands at 183mph; set by New Zealander Burt Munro in 1967. 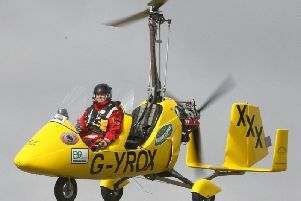 Munro was 68 and was riding a 47-year-old machine when he set the record. But 23-year-old Sam and his team of experts are confident their machine is up to the challenge. “The bike is designed to travel at speeds of up to 250mph, but we think it is capable of reaching 280mph,” he told the Times. Only one final hurdle stands between Sam and his shot at breaking Munro’s record; funds to transport the bike across the Atlantic. He added: “We will be challenging for the record in late September, and need to raise about £10,000 between now and then to be able to fly the bike out to America. Sam’s ambition of following in the footsteps of Munro stems from words of encouragement he received from prominent local engineer, Professor Gordon Blair. As an esteemed academic, he in turn inspired Sam to pursue his dream of becoming an engineer. “When I met Professor Blair I was still at school and, because of his interest in motorbikes, we talked amongst other things about Munro’s record,” Sam added. “To me it was just a pipe-dream but when one of the world’s greatest engineers tells you that something can be done, you know it’s not a fantasy but it’s a reality. Sam’s quest to become the new record holder has also been backed by Munro’s son, John. What make’s Sam’s story all the more incredible is the fact that he suffers from severe dyslexia, which meant getting an education has proved to be a struggle for the Islandmagee man. “As a kid I was told I had no prospects, but I wouldn’t accept that,” he added. But Sam’s quest is not just about fulfilling his own personal ambitions; he also wants to showcase Northern Ireland as a centre of excellence for engineering. He is currently an ambassador for the Science, Technology, Engineering & Maths (STEM) Network, and aims to encourage young people to pursue STEM subjects. During his gap year at Queen’s, Sam was selected for a placement with the Red Bull F1 racing team, working as a junior design engineer. “I was told I had been selected for position because I had stated my ambition was to break Munro’s land speed record. It was my dream to attempt something ambitious that caught their attention,” Sam said.